Today on the blog, we have the luxurious wedding of Amanpreet and Jas which was held at the beautiful lakeside venue Alrewas Hayes in Staffordshire. Alrewas Hayes really is a glorious private estate in the country side. The location was very spacious and grand in appearance and so perfect for this beautiful wedding. Desi Bride Dreams were the chosen Asian wedding coordinator team for this stunning wedding! Amanpreet and Jas booked us eight months before their wedding as they realised the importance of an Asian wedding coordinator. As they had a large supplier team and a large venue (Alrewas Hayes), an Asian wedding coordinator was definitely an essential item on their wedding planning list, therefore the Desi Bride Dreams team was booked well in advance. The outfits were chosen from Raishma Couture and Bibi London. The wedding outfit was a vibrant red in colour and had a heavily detailed skirt with a simple shirt, embroidered with glistening jewels and diamonds. Less is definitely more here! The bride’s make up was done by the talented Ravita Pannu, who left our bride looking exquisite. The newlyweds had really pulled out all the stops as they colour coordinated to create a beautiful look. The reception gown was elegantly designed suiting summer colours and it, again, coordinated with the groom’s outfit. The suppliers did a spectacular job with creating a gorgeous table to match the elegant theme. They organised awe inspiring orchids overhanging in divine vases as centrepieces for our tables. The centre stage was draped with white curtains, to match the soft and gentle ambience, with fairy lights bringing the warmth into the atmosphere. The colour scheme of purple and gold was carefully chosen to create a classy and romantic stage, directing all the attention to our lovely couple. The Desi Bride Dreams Asian wedding coordinator team arrived extremely early at Alrewas Hayes as we always like to oversee the set up. We don’t just turn up an hour before the reception starts and hope for the best! Instead we take a lot of time over the pre planning and ensure that everything is executed as you have agreed with the suppliers. Also, of course according to the floor plans which you would have signed off. One of the suppliers was booked for the wrong time, and as part of our as the wedding coordinator, we always check all of the details. We quickly rectified this in the week of the wedding. We feel that the Asian wedding coordination package forms a link between the suppliers and ourselves and we can truly allow the couple to relax whilst we manage the crucial details. 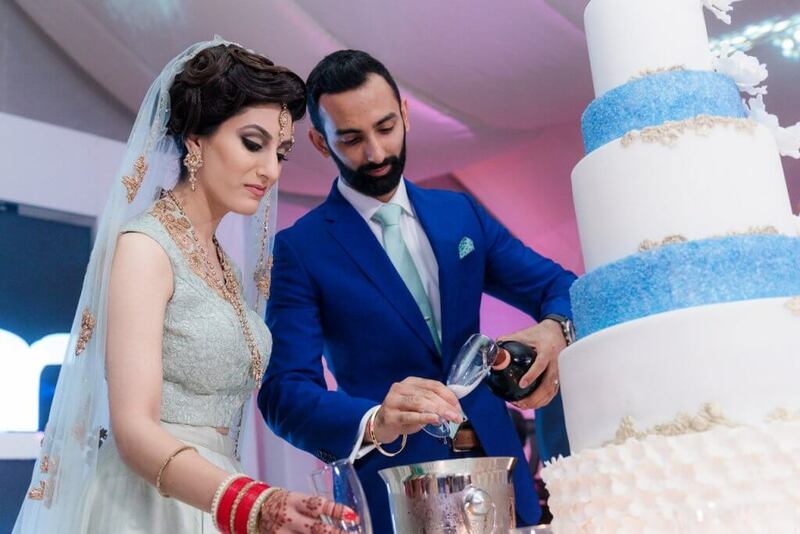 By choosing Asian wedding coordinator – Desi Bride Dreams, we ensure that there is a set itinerary for the day so you have full control and we still involve you in the main decisions, without the added stress of calling different suppliers. We take charge of the running and execution of the events and take care of the little things that still make a difference, like distributing wedding programmes and ensuring the guest book table is set up. We are a professional and experienced team, and you can therefore be rest assured that you and your wedding are in safe hands. We were really pleased with how the day went and it was great to see that the Baraat arrival was at 8.30am which as you know is completely unheard of! This meant that the day was running on time and Amanpreet and Jas had a truly relaxed and wonderful day! Having an Asian wedding coordinator benefits you immensely. We are your go to when you feel stressed and need help dealing with caterers, photographers etc or just to have a chat to reassure you that things are going perfectly in the weeks leading up to the wedding. Desi Bride Dreams Asian wedding coordinator will become the main contact between you and suppliers ensuring that you and your family are not overwhelmed and you can enjoy your happy occasion and the lead up to it. Being the first team at your venue on the wedding day means we can assist all the suppliers to make sure your dream day is executed to perfection, as it should be. We are now booking clients for both 2018 and 2019 so please do drop us an email on hello@desibridedreams.co.uk if you are interested in our Asian wedding coordinator package. We would love to hear from you and start planning your unique Asian wedding!